SelecTech, Inc. a leader in the manufacture of innovative residential, commercial and industrial flooring products from recycled materials, has unveiled their newest product for industrial environments, EpoxyStyle ESD. Created for industrial areas and open area environments such as shipping and receiving areas, warehouses and production floors, SeleTech’s EpoxyStyle ESD is a tough, two-part epoxy floor finish for areas requiring guaranteed static protection. The newest product in SelecTech’s StaticStop ESD line, EpoxyStyle ESD offers excellent adhesion, easy application, low odor and superior toughness and durability. It is also chemical and abrasion resistant. Best of all, it may be installed over old VCT and concrete. EpoxyStyle ESD provides a uniform matte finish, but for applications where gloss is desired, it may be enhanced with DuraShield ESD finish. EpoxyStyle ESD is available in four colors: dark gray, light gray, beige and blue. The product is dry to the touch within five to seven hours after application and ready for traffic within 10-12 hours after application. EpoxyStyle ESD complies with Ozone Transport Commission and California VOC regulations. Christopher I. Hughes, Inside Sales Manager oversees sales of EpoxyStyle ESD flooring product among other products in SelecTech’s StaticStop ESD line. For more information, visit www.selectechinc.com. In addition to EpoxyStyle ESD, SelecTech’s line of StaticStop ESD flooring solutions include SelecTile ESD, FreeStyle ESD, and FreeStyle CVT. SelecTech’s ESD products are versatile enough for a variety of static control environments from electronic manufacturing environments, server rooms, data centers, Federal and State government operation centers, PBX, HUB and call centers to retailers, commercial buildings, health care facilities, food service providers, schools and more. 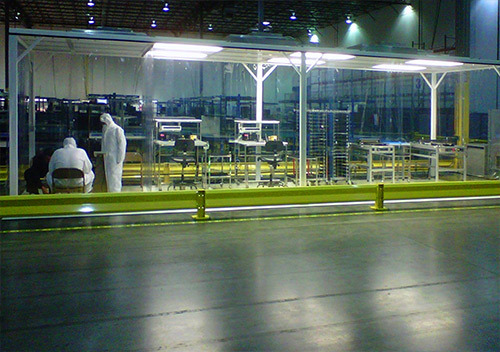 Companies that utilize SelecTech’s static control flooring include GlaxoSmithKline, T-Mobile, Boeing, USPS, Dell, Crestron Electronics, Volvo and the Federal Aviation Administration. In a recent scientific test study conducted by a renowned, independent static control consulting firm, SelecTech’s commercial and industrial static control flooring systems passed resistance flooring/footwear tests with flying colors. StaticStop SelecTile ESD and FreeStyle ESD flooring systems exceeded requirements for grounding personnel and ensuring that personnel walking on it, particularly in environments of extreme sensitivity, generate minimal voltage. With a maximum walking voltage level result of seven volts, StaticStop SelecTile ESD and FreeStyle ESD are well under the 100 volts desired by companies handling ESD sensitive devices. SelecTech, Inc. was founded in 1993 with the mission of creating valuable products from scrap plastics. The company has become a leader in the manufacture of flooring products from recycled materials and uses one million pounds of recycled materials annually. Their products are made with up to 70 percent recycled content, are 100 percent recyclable and installed without adhesives making them some of the “greenest” and most cost-effective flooring products available. The unique interlock system on SelecTech’s flooring products enable them to be installed at a much lower cost, without a lot of costly downtime, which provides significant value to customers. Using state-of-the-art technology and innovative product design, SelecTech created the top performing Place N’ Go residential flooring products, which are available at Home Depot. They are also the creators of the renowned commercial and industrial FreeStyle, FreeStyle ESD and StaticStop ESD flooring lines. SelecTech is a vendor partner of Health Care Institute, an International Facility Management Association (IFMA) alliance partner. The company is headquartered at 33 Wales Avenue, Suite F in Avon, MA. For more information about SelecTech, visit http://www.selectechinc.com.